What's your favorito River Phoenix movie? 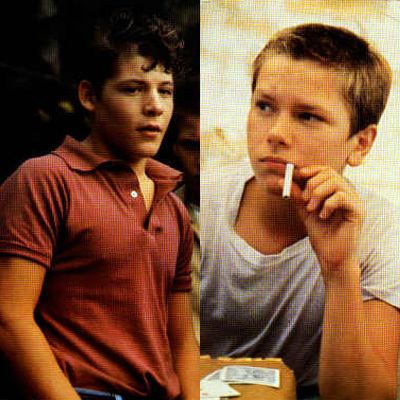 Do you agree with the comparison being made of River Phoenix to James Dean? The fans pick: No, River had his own unique style. Which song do you think would be perfect for River? What's his middle name ? What celebrities that are alive now remind you of River Pheonix? From my perspective, Poison Ivy is one of my favorito batman characters; one reason why is because she reminds me of nature and plants. Also, I can imagine an alternate version of the scene in the Season 3 episode Batgirl Begins Part 2 (from The Batman) where Barbara is quite surprised at her friend Pam’s new look. A tortured heart, an altered mind. As screaming voices filled the night. Hold close the fallen, crumpled Leaf. They watched a supernova die. A champion, a golden knight. The movie Stand por me, based on the book "The Body" written por Stephen King, released for the first time in theaters on 1986 will be completing 25 years on 2011.And as a homage to a film so good and so successful like Stand por me, nothing better than to release the film in theaters once again. Therefore we call on the Columbia Pictures to release Stand por me in theaters again. It would be a celebration of the height of this film that marked its time and a huge gift to all fãs of this masterpiece of cinema.